A tropical garden housed in a contemporary corporate space. One of the biggest tragedies of urban life is that space often finds itself trapped in functionality while compromising on its potential for creating beauty, evoking serenity and being able to heal. 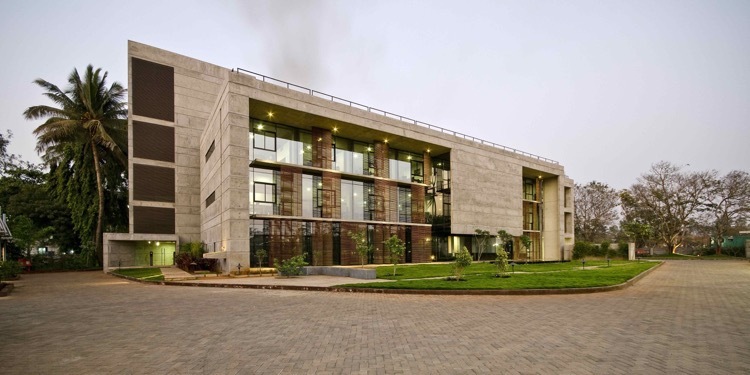 For Pune-based CORE Architecture this was more than just a fleeting concern and that’s why when designing the 8000 sqm Elantas Beck India Ltd headquarters in Pimpri, they decided to seamlessly combine the world of green architecture with high-end technology. 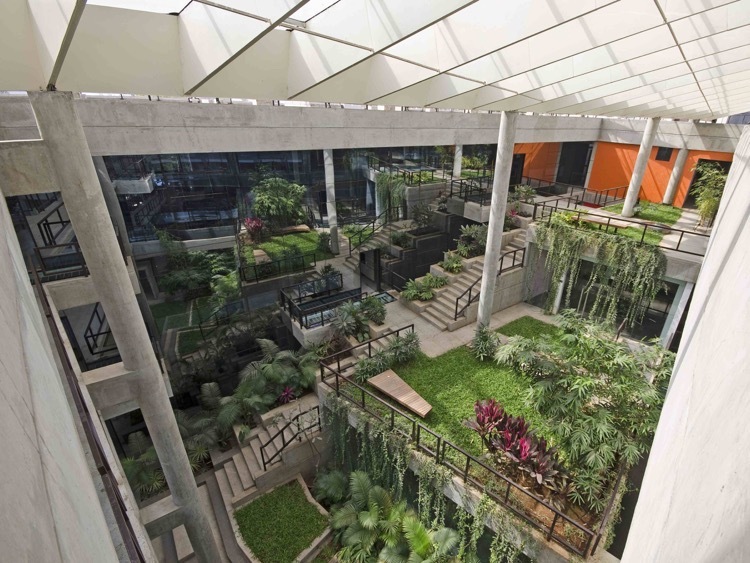 The result — a tropical garden housed in a contemporary corporate space. The space encourages users to walk instead of taking the elevator. The Entrance into the Building. 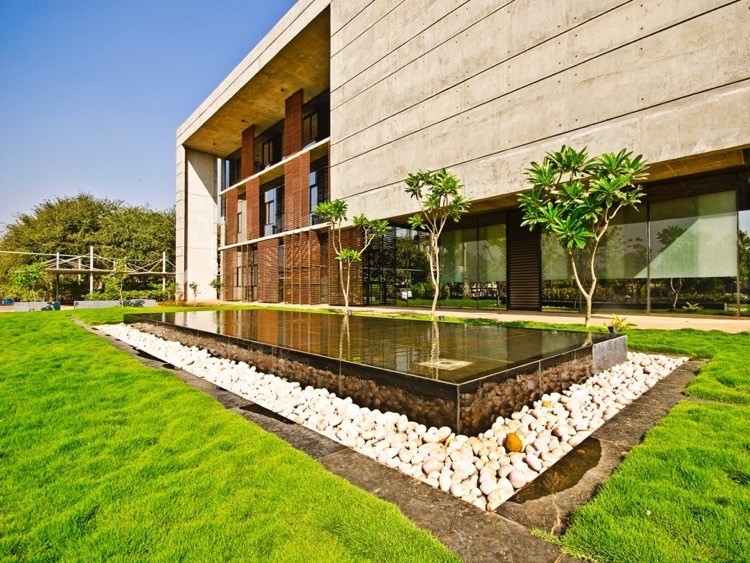 The office’s sculpted tropical garden not only serve as a visual feast but also add moisture to the space and create a microclimate which reduces the ambient temperature in the building. 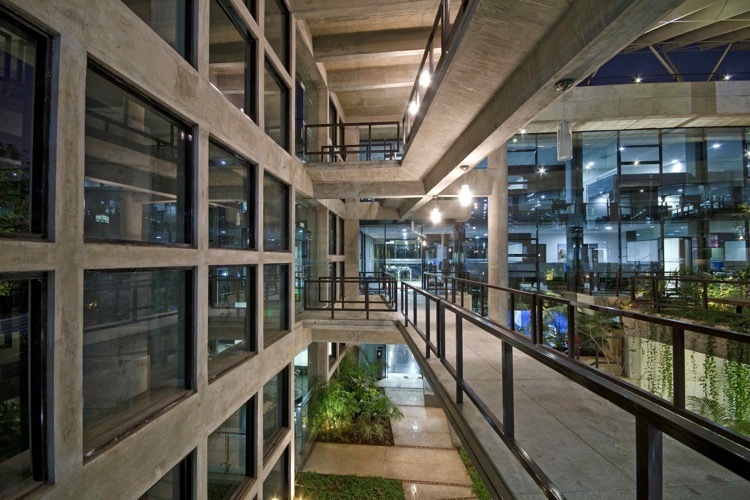 The energy-efficient architecture of the space further lends itself in the structure of the office. For example, the East and West side of the building are left with very small or no openings, so as to block the harsh horizontal sun in the morning and evenings. All the light necessary for working is derived from the North and South facades of the building, which are completely open. During the summers they derive only diffused sunlight — preventing the office from overheating and the residents from encountering any blinding light. Though glass has been used extensively on these sides to gain enough light for a vibrant work environment, shading devices and adjustable louvres have been used to eliminate heat transfer inside the building. Whereas the concrete walls on the East and West sides have a ventilated cavity which further keeps the interiors of the building cool. The materials used for the structure, like recycled fly-ash bricks for the internal walls further reduce the carbon-print of the site. Recycled fly-ash bricks have been used for the internal walls of the building. 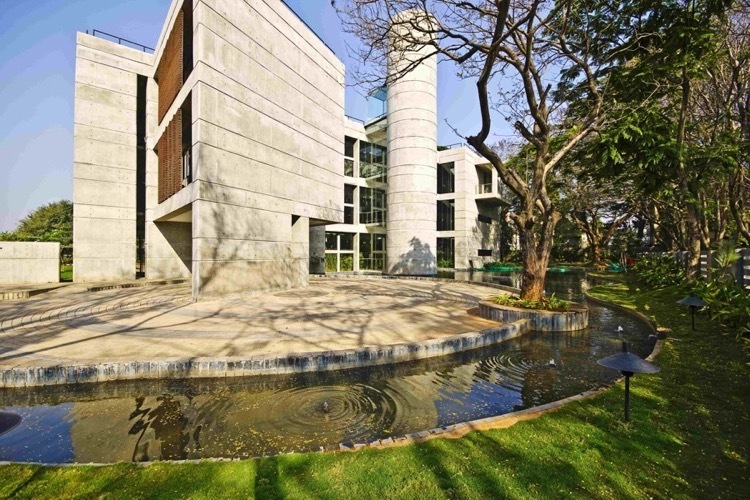 Keeping up with yet another principle of green architecture — zero wastage, the excavated topsoil that remained after paving the grounds for parking was used for landscaping the outer garden. To the East of the garden is a coconut plantation which opens out to a reflecting pool that collects storm water from the roof. The overflow eventually runs into tube wells which then recharge the site’s groundwater. 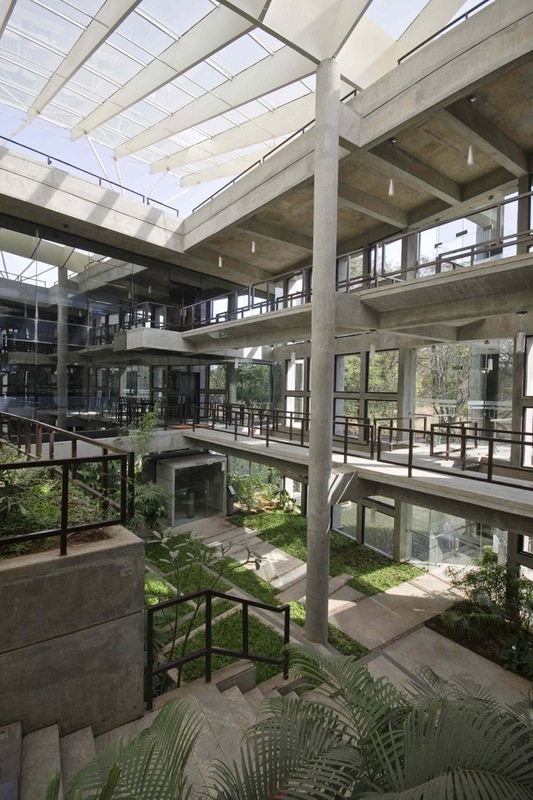 A self-sufficient natural-haven of its own, the headquarters are a tribute to an eco-conscious lifestyle. 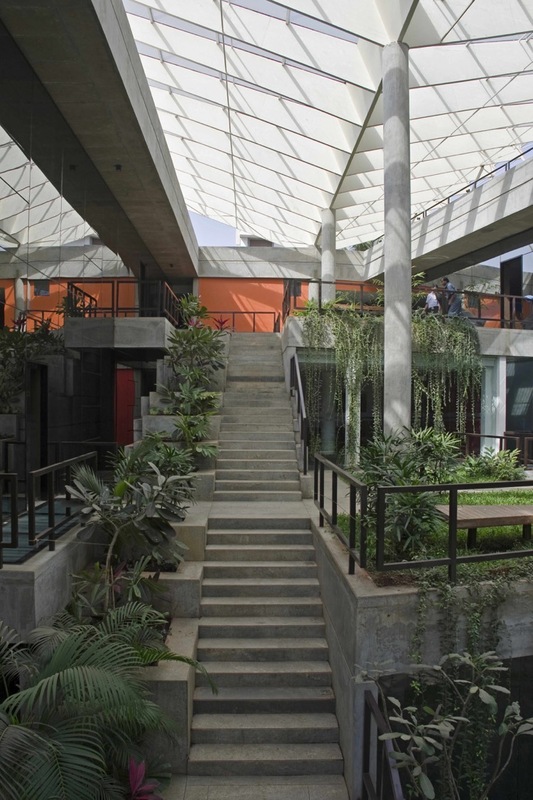 Though perhaps the most endearing quality of this natural haven is that without any cosmetic frills it is able to create a meditative and yet vibrant character for the office — a blessing for demanding corporate life. As for CORE Architecture, the project represents a profound personal victory. “We have been struggling with beauty and proportioning systems for a long time. This struggle finds its climax in this building,” confesses Kulkarni.